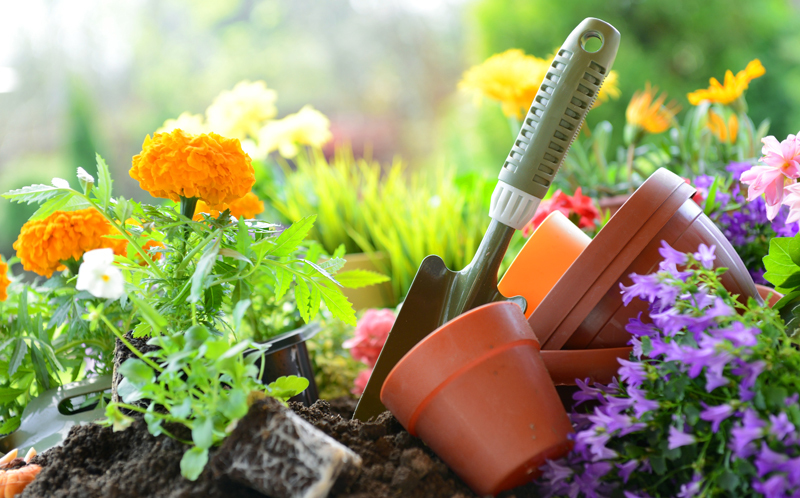 As soon as the chance for frost has passed (this is typically around May 1st to Mother’s Day for our area), you can begin planting warm-season annuals, vegetables and herbs. As long as the ground is workable and not too wet, you can be planting perennials, trees and shrubs any time. If you are creating your own container gardens, start early to enjoy fuller containers earlier in the season. This will help retain soil moisture, prevent weeds and disease. Early-spring flowering bushes should be pruned soon after flowering. These include forsythia, viburnum, lilac, azaleas, rhododendrons, mockorange, and St. johnsowort. If you haven’t already, prune certain roses when leaf buds begin to swell. Mow regularly, not cutting blades back more than 1/3rd. A 3” height is recommended. U of I Lawn experts recommend fertilizing your lawn with a Nitrogen fertilizer between May 1st – 15th. Apply organic fertilizers such as manure, fish emulsions and bone meal once the soil temperature reaches above 60 degrees. Fertilize annuals with liquid or slow-release fertilizer, such as Miracle-Grow. Fertilize containers consistently since watering eliminates many nutrients from the soil. Fertilize roses when you see flower buds, according to fertilizer instructions. Watch for disease and pests and treat as needed. Actively treat weeds as they sprout up by pulling them out by the roots or applying weed solutions, such as weed-b-gone, according to label instructions. Apply broadleaf weed control, according to label instructions. Canna, tuberous begonias, Dahlia bulbs and more should be planted in may for summer blooms. Divide and transplant perennials and shrubs in early May to minimize shock and give them time to establish prior to bloom time. After you’ve hardened off your seedlings, transplant them into your garden beds. Remove spent blooms to promote new growth throughout the growing season.